Milwaukee’s Indian and Pakistani venues offer some of the most delicious lunch and dinner options in the area. Whether you’re in the mood for a surprisingly delectable food court lunch or a banquet dinner, you’ll find something that captures your attention in this list of reviews of Milwaukee’s Indian and Pakistani restaurants. When this magazine has fired up its periodic Cheap Eats story engine, Morgandale’s Bombay Sweets has been one of the first stops. You can build a very respectable meatless meal from the vegetarian platters, curries and rice specialties served at this simple showroom of sit-down-and-carryout foods. It’s also a hub for Indian snacks – salty and sweet, nutty and gooey, gelatinous and creamy and every mouth sensation in between. Anmol offers some of the most authentic Indian/Pakistani food you’ll find this side of Karachi. We’d be remiss not to mention the fantastic chicken makhani and mutton biryani, but true bargain hunters should go for the rolls: kebabs and chicken specialties wrapped in roti, naan or paratha. But when holding these generous delicacies, use both hands. Maharaja won our 2016 Readers’ Choice Dining Award for Indian/Pakistani food – and for good reason. Their signature chicken tikka masala and vegetable kadai dishes are fit for a Maharaja (“king”), and their excellent lunch buffet and other regular lunch and dinner options are authentic dishes originating in various parts of India. Chicken Tikka Masala photo courtesy of Maharaja. Past Indian Bazaar’s rows of rice and spices is a modest dining room: utilitarian tables, plastic cutlery and a water cooler. But in that dining room – and through a tiny window – come Indian delicacies of the vegetarian persuasion. You can’t go wrong with the dosa, an Indian crepe of sorts filled with varying types of curries. All dosas come with an assortment of chutneys and the ubiquitous sambar as a dipping sauce for the flaky feast. The standout is the masala dosa – which measures about 2 feet in length. The “garden” plot is the old Open Hearth, a Tosa steak-and-chops place that left behind a bar, gas fireplace and the coziest booths west of Highway 41/45. Indian Garden’s owner Charnjit Bolla (a former partner in the East Side’s Maharaja) is the restaurant’s master gardener, you could say, and the garden is anything but small. Vegetarian dishes are an especially fruitful part of the menu. A worthy addition to anyone’s Indian food rotation, the lunch special at this restaurant in a gas station strip mall includes portions of as many dishes as your server can ladle into a carryout container (saag paneer, lamb curry and chicken tikka masala are possible). Once they add the soda or lemonade, this becomes one happy meal indeed. But for its freshness and that pop of spiced flavor, our money these days is on Royal India. The chicken tikka masala – for which England, a country known for great Indian food, takes credit – is at its richest, sweet-spiciest. They use the tender thigh meat. The garlic-stuffed naan is terrific – tender and chewy, the garlic strong but without too much pungency. 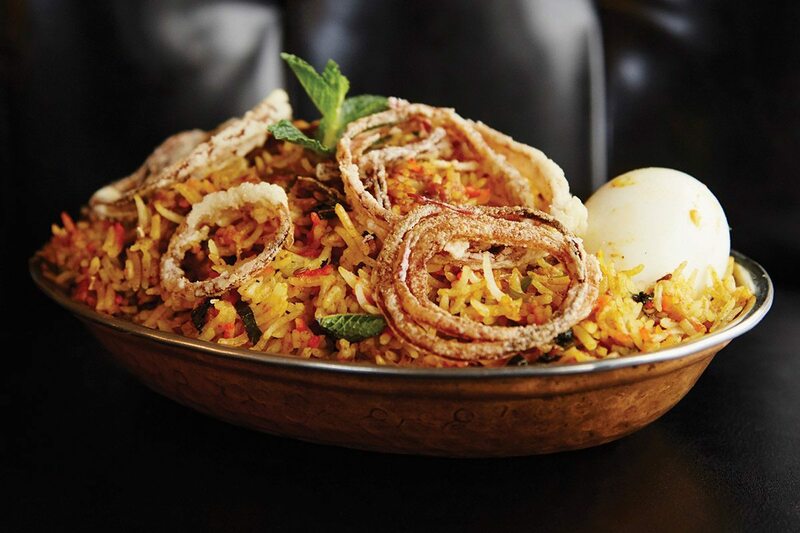 Our favorite biryani combines chicken, lamb and shrimp. The servers at Royal also couldn’t be friendlier. Located inconspicuously in a downtown food court, Shah Jee’s offers cheap and delicious options and is open only from 11-2:30a.m. on weekdays, much to its patrons’ chagrin. Get there early during lunch time, as it fills up fast, and take full advantage of their $7 two curry items and a drink deal. Formerly known as Mayura Indian Restaurant, Bollywood Grill heralds dishes originating from all over India. We’d recommend their Masala Dosa, which is served with sambar and coconut chutney, or their Beef Korma, a beef curry cooked in cream, raisins, cashews and herbs. Their large banquet room is perfect for dining-in, but if you prefer to stay in, their delivery is efficient and can be done online. Worry about your friends and family members’ meat-eating proclivities no longer – Taste of India offers a large variety of options for vegetarians and omnivores alike. For vegans and vegetarians, their Shahi Paneer, chunks of cheese smothered in creamy sauce, ginger, garlic and tomatoes, is to die for. And for the meat-eaters out there, don’t leave without trying their chicken coconut. If you’re new to Indian food, Tandoor is the place to go, as their staff are more than willing to help you find something to satisfy your taste buds. We’d suggest starting with samosas for an appetizer and Paneer Bhuna for your main course (a simple vegetable-cheese curry). But if you’re feeling adventurous your second time around, try their Lamb Mango. This unassuming eatery is perfect for eating-in or taking-out. Either way, don’t miss out on Taj Mahal’s popular Gobi Manchurian (fresh cauliflower stir-fried in the chef’s signature sauce) or their Tandoori Paneer Tikka. If neither of those make your mouth water, their enormous menu offers a variety of traditional options, like Chicken Tikki Masala and nine different kinds of naan.